The “Winter Wonderland” theme for this year’s Treasure Hunt was very fitting considering the day the treasure was found was the first day of the season that snowflakes fell from the winter sky. For Cody Owens and his family, finding the treasure was a stroke of luck. Owens found the treasure Monday, January 2, 2012, after only two days of searching. 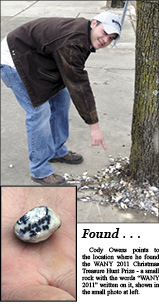 The clues, being broadcast by WANY along with several businesses in town posting signs on their doors, led Owens to the base of a tree on the sidewalk in front of City Hall. The “prize” was a rock with a snowman and WANY painted on it. Owens is a believer now … a believer that the treasure hunt is a good thing and it provides hope for families in the area. Since December 10, 2011, people have been combing the streets looking for the treasure. Clues have been posted at local businesses in order to promote shopping at home and with the conclusion of the treasure hunt, the purpose has been successful. Other than the grand prizes, several smaller reindeer prizes were distributed all over town and persons finding a “reindeer” were able to take it to the radio station to draw out a particular prize. The grand prize consisted of $1,000 cash and an additional $1,000 worth of merchandise prizes. Owens said WANY Owner Pam Allred told him there were several gift certificates and items of that nature included in the prizes. During the interview Monday with Owens, he said he hadn’t told his wife because she was at home without the phone. “I haven’t told her yet, but she is fixing to get a surprise,” Owens said.